Spelling. Are you looking for Absorbtance? 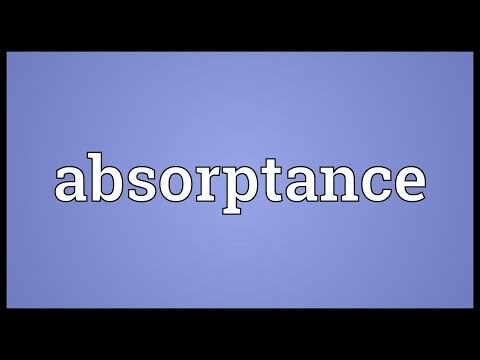 What does absorptance mean as a name of something? [physics] the ability of an object to absorb radiation, measured as the ratio of absorbed flux to incident flux. and absorption coefficient: Absorptance is a number between 0 and 1 that tells us what fraction of the incident light is absorbed by the window. = The overall absorptance is a function of the characteristics of the incident radiation and is, therefore, unlike the monochromatic absorptance, not a property of a surface alone. drop concentration, while cloud absorptance is a function of drop. The value of this 11-letter word is 17 points, but it's not an accepted word in the Official Scrabble Players Dictionary. Go to the thesaurus of absorptance to find many related words and phrases! This page was last modified on 2 June 2017.